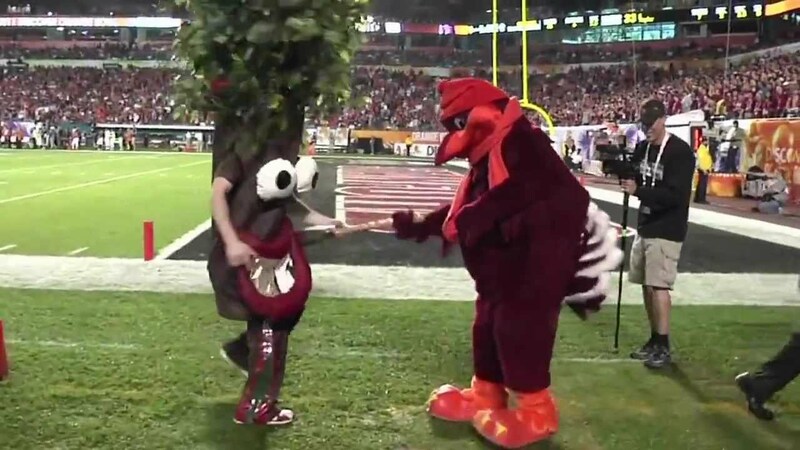 Hokie Bird Smackdown vs Stanford Tree took place during the 2011 Discover Orange Bowl. The 2011 Discover Orange Bowl was a postseason college football bowl game between the Virginia Tech Hokies and the Stanford Cardinal on Monday, January 3, 2011, at Sun Life Stadium in Miami Gardens, Florida. Stanford defeated Virginia Tech 40–12. The game was part of the 2010–2011 Bowl Championship Series of the 2010 NCAA Division I FBS football season and was the concluding game of the season for both teams. The game, the 77th edition of the Orange Bowl, was televised in the United States on ESPN and the broadcast was seen by an estimated 8.23 million viewers. Virginia Tech was selected to participate in the Orange Bowl after an 11–2 regular season that culminated with a 44–33 win in the 2010 ACC Championship Game. Stanford was picked as the other half of the matchup following an 11–1 campaign that included the school’s best-ever regular-season record. That performance earned the Cardinal a No. 4 ranking in the BCS Poll and the automatic bid to a BCS game that accompanies a top-4 ranking of a second school in a conference other than the champion. In the weeks before that game, media attention focused on both teams’ turnarounds from historical difficulties and the performance of Stanford quarterback Andrew Luck. The game also was the first Orange Bowl not sponsored by FedEx in 21 years, ending the longest-running title sponsorship deal among the major bowls. The game kicked off at 8:39 pm in warm weather, and Stanford scored first, a touchdown, with its third offensive possession. Virginia Tech briefly took the lead with a safety followed by a touchdown of its own, but Stanford restored a 13–12 advantage before halftime. In the second half, Stanford pulled away from Virginia Tech as it scored 13 points in the third quarter and 14 in the fourth while holding the Hokies scoreless. In recognition of his performance during the game, Stanford quarterback Andrew Luck was named the game’s most valuable player. He set a Stanford bowl-game record for touchdowns, and threw three of those scores to tight end Coby Fleener, who set a Stanford and Orange Bowl record with 173 receiving yards. Both teams made coaching changes after the game, as Stanford head coach Jim Harbaugh left the team to coach the National Football League‘s San Francisco 49ers and Virginia Tech replaced several assistant coaches. Players from each team were selected in the 2011 NFL Draft.